If your dogs are anything like mine, they demand food on a pretty regular schedule each day. But simply giving your dogs food doesn’t provide much of a mental challenge for them, and a bored dog can get destructive or lethargic. It’s important to keep the mind sharp, and the best way to do that is to work it out with exercises, just like a muscle. 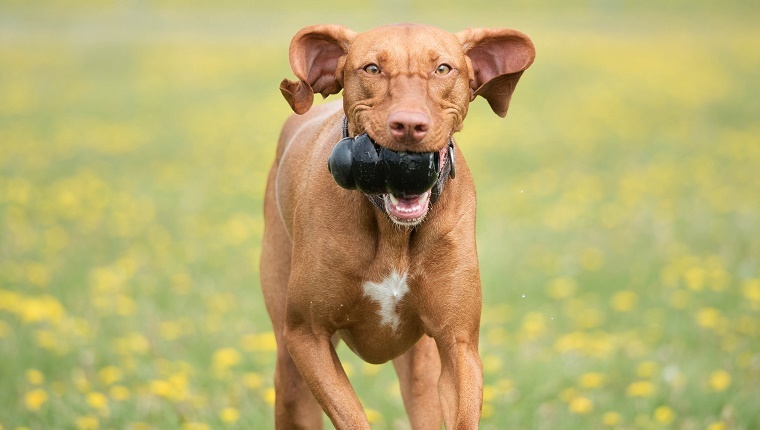 Luckily, there are plenty of mental workouts you can do with your dogs that will keep them using their brains, and they’ll have fun at the same time. Here are a few of our favorite mentally stimulating exercises you can do with your dogs at meal time. Wolves hunt for their food, and while your dogs are not wolves, they do have some of the same drives to track their food. Playing “find it” allows your dogs to use some of those instincts and provides more of a challenge. Start out by hiding a bit of food while your dog watches you, then allow him to “find it.” Gradually make the game more challenging until you can hide your dog’s food while your dog is in another room, then have him come in and use his wits and senses to find his meal. 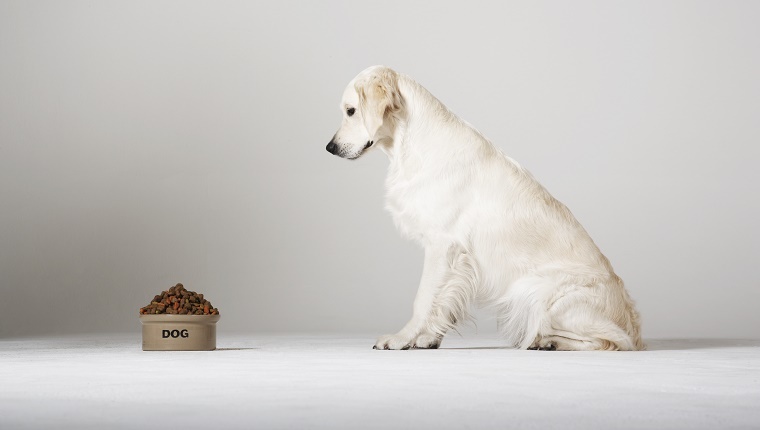 Your dogs’ food can be used as a reward and as a teaching tool to learn or practice commands. 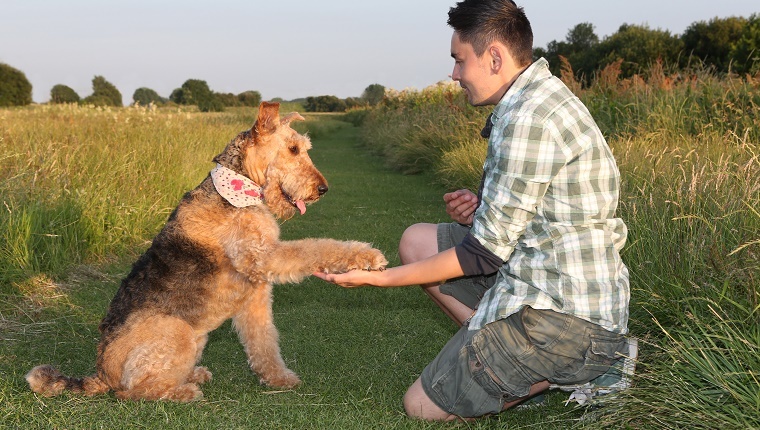 This allows your dogs to work for their food, and it strengthens your bond by bringing your dogs’ focus to you. Your dogs will also come to see you as a provider. At meal time, have your dogs practice commands, but be sure to switch up the commands and the order of the tricks, as well as adding a few new ones from time to time. Keep your pups on their toes. “Stay” is a command that requires a lot of discipline, but it’s an important one to learn. “Stay” can be used to stop dogs from running off, prevent them from jumping up on people, and help them avoid encounters with dogs that might not be so friendly. At meal time, practice placing your dog’s food in front of him and don’t let him eat until you indicate that he can do so. Vary the amount of time you have him stay. Eventually try walking away from the bowl or turning your back. Your dog will come to rely on you to give the command to eat while staying disciplined. Food puzzles or enrichment toys are a way to keep your dogs working for their food. They can also slow down your dogs from eating too fast and help them maintain a healthy weight. There are plenty of food puzzles on the market, and they can be as simple as a regular Kong or more complex like puzzles that require your dogs to perform a specific task before giving them food. Find one that your pups enjoy. The Shell Game is the same for dogs as it is for humans. Start off by placing a piece of food under a transparent cup or bowl, then, while your pup is watching, mix that cup up with two others. Have your dog indicate where the food is before allowing him to eat. Repeat the process until your dog understands the game, then swap out the transparent cup for a regular one. Now your dog will have to follow the food and use his brain and nose to find it. This is a simple mental exercise that will keep your dog thinking. What are some of your favorite mentally stimulating challenges for your dog at meal time? Let us know in the comments below!